Sondheim was of course dealing with a more genteel era. Prominent wives are quite different these days these days. Take Mrs. Clarence Thomas — PLEASE! “Virginia Thomas received her law degree in 1983 from Creighton University School of Law and served on its Law Advisory Board from 2006 to 2007.Thomas had worked as an attorney in Omaha, Nebraska. She first gained federal political experience as a congressional aide and later worked as an attorney and labor relations specialist for the United States Chamber of Commerce in 1988. While at the Chamber of Commerce, Thomas helped to lobby against the Family and Medical Leave Act, arguing that it intruded into the private sector. In 1989, she served as manager of employee relations at the Chamber of Commerce. In 1991, Thomas was employed by the United States Department of Labor, and worked in the legislative affairs office. While at the Department of Labor, Thomas argued against comparable-worth legislation which would have mandated equal pay for men and women in the workplace. And she’s had such good advice in creating it! A widely criticized decision. Chief Justice Roberts is still bitching about President Obama’s dissing. Yes, Roberts was surrounded — just like General Custer. It’s the old song and dance, folks. Did you say “Conflict of Interest”? “I think the American public expects the justices to be out of politics,” said University of Texas law school professor Lucas A. “Scot” Powe, a court historian. He said the expectations for spouses are far less clear. “I really don’t know because we’ve never seen it,” Powe said. Under judicial rules, judges must curb political activity, but a spouse is free to engage. “We expect the justice to make decisions uninfluenced by the political or legal preferences of his or her spouse,” said New York University law professor Stephen Gillers, an expert on legal ethics. What you “expect” and what you actually get are of course two very different things. Virginia Thomas declined to comment in detail about her plans for LibertyCentral.org, which she said would fully launch in May. In a brief phone interview, she did not directly answer questions about whether she and her husband had discussed the effects her role might have on perceptions of his impartiality. “I don’t involve myself in litigation. Are you asking that because there’s a different standard for conservatives? Did you ask Ed Rendell that question?” she said, referring to the Democratic governor of Pennsylvania, who is married to a federal appellate court judge. But watch your back, Ginni, she’s obviously a communist! “We have our separate professional lives,” she said at the time. Sure. Just like Mrs. and Mrs. Howie Kurtz. She makes Arnold Governor of California and he simply talks about him. “The judicial code of conduct does require judges to separate themselves from their spouses’ political activity. As a result, Marjorie Rendell, a judge on the 3rd U.S. Circuit Court of Appeals, has stayed away from political events, campaign rallies and debates in Pennsylvania. Her husband discussed such issues in his first campaign for governor. There! Does that satisfy you? 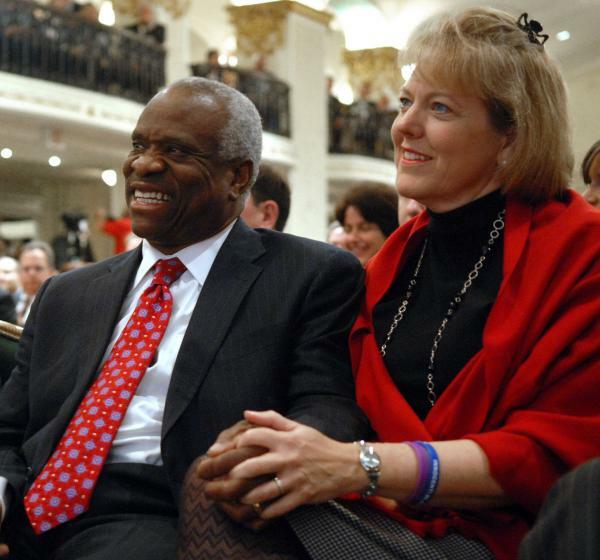 “Law professor Gillers said that Justice Thomas, too, should be on alert for possible conflicts, particularly those involving donors to his wife’s nonprofit. “There is opportunity for mischief if a company with a case before the court, or which it wants the court to accept, makes a substantial contribution to Liberty Central in the interim,” he said. Justice Thomas would be required to be aware of such contributions, Gillers said, adding that he believes Thomas should then disclose those facts and allow parties in the case to argue for recusal. See? It’s up to the fox to guard the henhouse. As a 501(c)(4) nonprofit, Liberty Central can raise unlimited amounts of corporate money and largely avoid disclosing its donors. Because of a recent Supreme Court decision, Citizens United vs. Federal Election Commission, the group may also spend corporate money freely to advocate for or against candidates for office. Justice Thomas was part of the 5-4 majority in that case. And as the ongoing Obama-Roberts set-to shows, we shall hear more of this masquerade. Meanwhile Mrs. Thomas, Lee Wiley will sing us out with a song by Will Marion Cook.